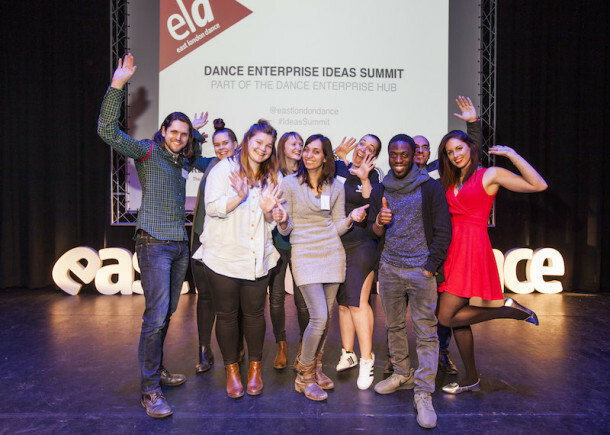 Bursaries totalling £25,000 were awarded to eight outstanding dance creatives at the 2016 Dance Enterprise Ideas Summit, a day-long event on Monday 21 March, hosted by East London Dance at Stratford Circus Arts Centre. The day culminated in the final round of pitches for the Dance Enterprise Ideas Fund, as 23 shortlisted artists, selected from a high-calibre pool 89 applications, pitched their ideas to the Dance Enterprise Ideas Fund panel: Polly Risbridger from East London Dance, Sian Astrop from Canary Wharf Arts + Events, Fleur Derbyshire-Fox from English National Ballet, Jonny Sidall from Redbridge Drama Centre, Rhiannon Wilkins from Rich Mix and Eva Martinez from Sadler’s Wells. Awarded £2,950 to develop an outdoor promenade performance inspired by the phrase “water under the bridge” with older people from East London. Awarded £2,425 to film a pilot of a new talk show and documentary based on international dance exchanges between emerging artists. Awarded £5,000 to establish a network of hip hop influenced individuals that want to create change within the dance profession and deliver a 3 day event of discussions, workshops and performances. Awarded £2,260 to create a dance theatre production inspired by the cases of police brutality towards black men in America and the UK and taking an in-depth look at racism in our society. Awarded £5,000 to develop a new dance theatre work which takes posthumous fame as its starting point, examining how we reconstruct the lives of the dead by looking at what they left behind. Awarded £985 to research how to roll out her successful dance film project that invites schools and community groups to create short creative films that inspire young people and their families to take responsibility for their lifestyle choices. Awarded £4,910 to devise a parkour-dance project with young men and their families resulting in an outdoor site-specific performance. Awarded £1,470 to collaborate with sound engineers, deaf artists, young people with hearing loss and an audiologist to research a new innovation to break down access barriers for deaf audiences watching dance. The Dance Enterprise Ideas Fund was established in 2015 to enable dance creatives to research, test and/or launch new artistic and entrepreneurial ideas. The Fund offers an award of up to £5,000 plus in-kind support from its supporting partners: Hoxton Hall, Studio Wayne McGregor and the University of East London. The Dance Enterprise Ideas Fund is presented as part of the Dance Enterprise Hub – a programme of skills development, creative incubation for new ideas, start-up funding and mentoring to enable dance artists to establish sustainable and successful creative businesses and/or careers. It is supported by Foundation for FutureLondon.